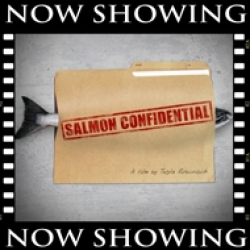 Salmon Confidential is a scathing new documentary brought to you by the grassroots, BC-based group, Department of Wild Salmon. It uncovers the government’s attempt to hide crucial information that threatens the future of salmon in this region. In the film, prominent biologist and wild salmon activist Alexandra Morton shows proof that fish farming is responsible for spreading deadly diseases into wild populations. She shows that governments know this but are actively denying it because if they admitted to the truth it would lead to an end to open-net fish farming and a moratorium on BC’s international trade of salmon. Now, there are a couple points about the film that I can’t stand behind, as an ethical vegan. One is that neither filmmaker nor biologist mention the immense suffering that the individual diseased or farmed salmon must be enduring. Also, especially at the conclusion of the film, the message that “salmon are here for us” is strong. While I can respect that salmon are part of the diet of bears, eagles, orcas, and coastal First Nations, I believe that salmon have their own inherent worth and desires, beyond just being ‘food’. That said, salmon still deserve our protection and I highly recommend this film. Standing up for the West Coast’s wild salmon and standing against fish farming is something that animal rights advocates need to do. In the name of protecting the wild West Coast, this is an issue on which people of different backgrounds can show solidarity on. Even though salmon defenders might not see eye-to-eye on everything, this issue needs all the voices it can get and I call on animal activists & vegan advocates to stand together with First Nations and activists like Alexandra Morton by sharing this film and this message far and wide. The Department of Wild Salmon is grassroots, science-based activism founded on the idea that we can’t depend on governments to do what’s right when it comes to protecting wilderness. Don’t miss SALMON CONFIDENTIAL this week at the VANCITY THEATRE, presented by SEA SHEPHERD! Alexandra Morton will be answering questions after the film.